Penn Graduate School Alliance for Field Practice with Kensington Sciences Academy (KHSA) brings the three Penn Futures Project schools (Nursing, GSE, and SP2) together to develop a Penn Graduate School Alliance for Field Practice at KHSA, a Philadelphia health science public school located in one of America’s most under-served neighborhoods. Understanding that developing practitioners to serve the needs of a community in poverty requires the expertise of multiple disciplines, this collaboration aims to serve as an innovative model for a partnership between a university and an urban school district for the purpose of developing and supporting a “whole child/community” model of professional learning. Serving LGBTQ Youth and Families: Preparing the Next Generation of Social Workers, Teachers, School Counselors, and Nurses – To better serve LGBTQ youth and their families – particularly transgendered youth of color – there is a pressing need to expand training opportunities and curriculum content for the next generation of social workers, teachers, school counselors, and nurses. Faculty, students, and alumni from SP2, GSE, and Nursing will work with partners from CHOP and The Attic Youth Center. 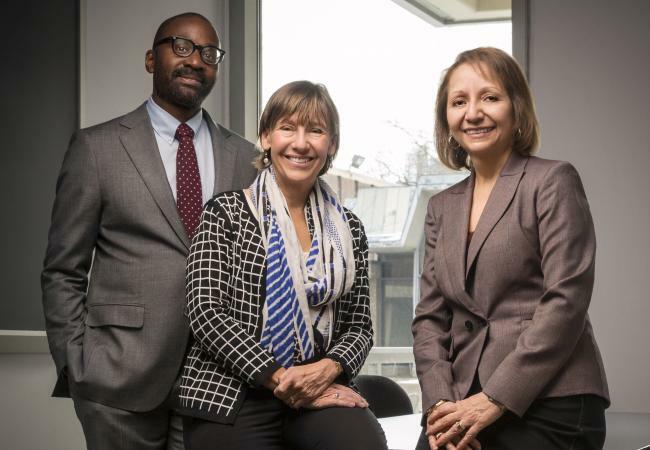 Together, they will review classroom and field learning opportunities for Penn graduate students, with the intent of preparing the next generation of clinical and educational professionals to better serve this vulnerable population. The collaborators will propose – and, where possible, implement – changes in the content of existing courses and the creation of new courses. Field training options will be expanded, and LGBTQ youth will be directly engaged in their work. A Penn Interdisciplinary Contribution to Data-based Decision-Making in Philadelphia – The opportunities for Integrated Data Systems (IDSs), which can make government more efficient through cross-system collaboration, are just beginning to be understood. IDSs can link individual administrative records across public agencies to provide an unprecedented and nuanced snapshot of the effects of poverty on children’s lives – and how factors such as homelessness or low birth weight might impact their outcomes. Expanding on previous work, this project draws together researchers from GSE, SP2, Nursing to support the City of Philadelphia's integrated data system in the Deputy Mayor’s Office for Health and Opportunity. This project will look across City systems and agencies to identify young children who are high-cost service recipients – and create a model that can be used to improve service delivery and inform intervention building. This work holds great promise for Philadelphia’s children – and may be a role model for cities nationwide. Each of the winning projects is expected to commence in spring 2016. Penn GSE is one of the nation’s premier research education schools. No other education school enjoys a university environment as supportive of practical knowledge building as the Ivy League’s University of Pennsylvania. The School is notably entrepreneurial, launching innovative degree programs for practicing professionals and unique partnerships with local educators, and the first-ever business plan competition devoted exclusively to educational products and programs.